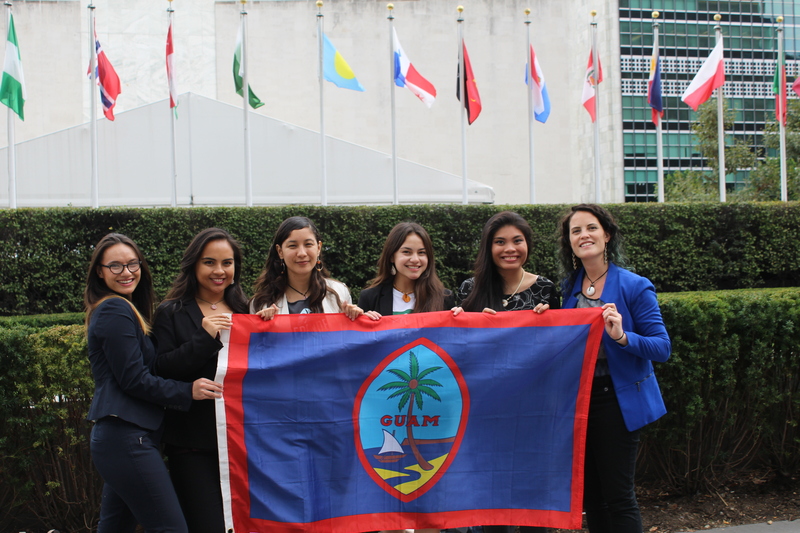 Earlier this month, I helped to organize a group of indigenous Chamoru women from Guam to testify at the United Nations Special Fourth Committee on Decolonization. This was my second time testifying before the U.N. on behalf of Guam’s right to self-determination and demilitarization. Last year, I spoke about the threats from North Korea to bomb Guam to retaliate against the U.S. and how world powers use Guam as a pawn. I spoke about our elders who survived the Japanese occupation of Guam during World War II and how they want our future generations to grow up without experiencing wartime violence. Guam became a target to Japanese forces because of the U.S. presence on the island. Guam is a Pacific Island in the Micronesian region of Oceania, and a current colony, or unincorporated territory of the United States. The island and her people, the indigenous Chamorus, have experienced nearly 500 years of uninterrupted colonization, from Spanish, Japanese and American colonial administrations. Chamorus have resisted colonial policies and militarism since the beginning of the island’s colonization, and today the island has active independence and anti-militarism movements which advocate for sovereignty and the protection of native land from U.S. military contamination. Today, one third of the island has been unjustly taken from the Chamoru people and is now in the possession of the U.S. military for use as training grounds and bases. In other words, the U.S. military is using our land and sacred sites to prepare for war and practice killing. This is not the reality that my ancestors would have wanted for their island and for their children. In 2011, Arnold Davis, a white American resident of Guam, sued the Government of Guam, claiming that not being able to register on the Decolonization Registry for a political status plebiscite (which is only open to native inhabitants) is a violation of his civil rights under the U.S. Constitution. The court ruled in Davis’s favor, and since then all activity on the Decolonization Registry has ceased—while the U.S. continues the relentless militarization of our homeland and envelops our people in death. The outcome of the case illustrates how impossible it is to fight for decolonization within the legal system of the colonizer, which only seeks to continue to justify dominance over my island and people. While the Government of Guam is caught up in this drawn-out legal process, the US military moves forward with poisoning our lands and waters without our consent. We cannot afford to lose anymore time. 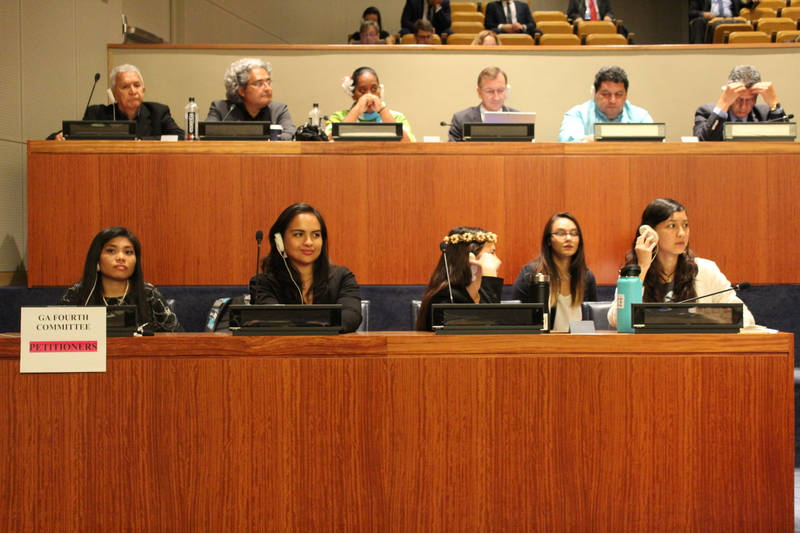 In this year’s U.N. visit, I talked about current threats to Guam’s self-determination process from the Davis Case and how the Government of Guam is exhausting all possibilities to achieve decolonization within the U.S. legal system, which continues to block our efforts. Petitioners only have four minutes to speak before the Fourth Committee, and the microphone is automatically turned off once you’ve gone over your time limit. For me, the experience is both energizing and exhausting. It is an honor to continue the work that generations of Chamorus before me have dedicated their lives to. It’s exhausting to limit our stories to the four minutes that we’re given to talk and to engage with institutions that weren’t built for us. In our movement for sovereignty, I am surrounded by Chamoru brilliance. 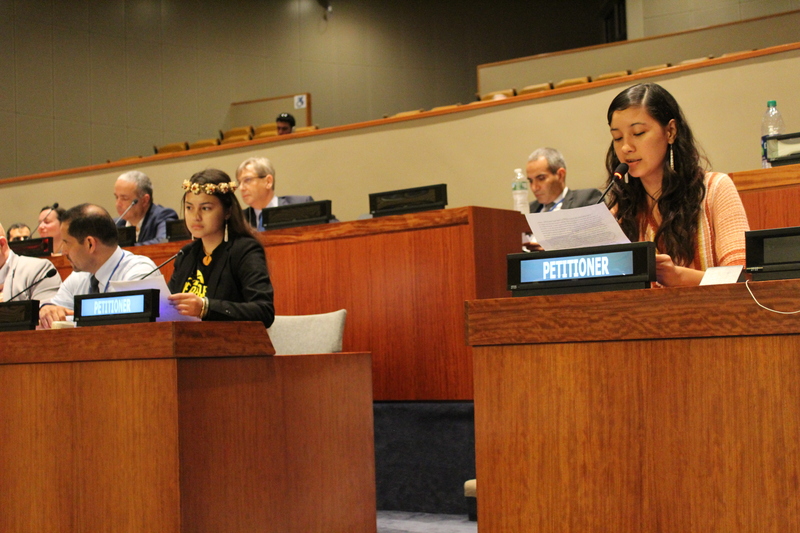 I have witnessed the ingenuity, creativity, and determination of my people as we fight for our island’s future in courtrooms—as Attorney Julian Aguon, representing the Government of Guam, did while arguing to appeal the Davis case decision in federal court, and in classrooms, where teachers speak to their students in Chamoru, remembering our elders that were once punished for speaking their language—in writing, and in song, both on island and across oceans. Watching my people continue to find ways to thrive despite 500 years of uninterrupted colonization brings me both incredible joy and a kind of heartbreak I don’t have words for. My seven-year-old brother asks me why he has to pledge allegiance in school to a country that most of the children in his class have never been to. 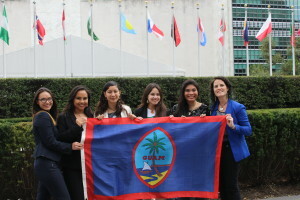 Why are Chamoru children made to pledge allegiance to a country whose president they can’t elect—while an American settler can participate in a plebiscite that is meant to give voice to the native inhabitants of Guam, who continue to be denied the ability to determine our political status? What does this tell our children about the worth of their lives? As Attorney Aguon has articulated: decolonization is not a right that applies to all, but rather a “remedy to restore a right” that was taken away from a group of people through colonization. My brother once asked me if other countries have fences surrounding places where only people with special I.D.s can go. He was referring to Guam’s military bases, built on lands stolen from Chamoru families. By comparing Guam’s reality to other countries, he was dreaming of different ways to exist in our homeland, of a reality where live-fire training ranges aren’t built atop resting places of our ancestors. This is where true sovereignty begins: in the dreams of our children. I tell him about Angel Santos, a Chamoru visionary who dedicated his life to sovereignty and who once jumped a military fence in protest of U.S. land theft and disrespect of the indigenous people. Despite experiencing colonial violence for as far back as our families can remember, we are still raising children whose radical curiosity and insight demand that we create better futures for them. The Government of Guam is defending Guam’s decolonization process and our right to express, by plebiscite, our desired future political status. This plebiscite is an opportunity to define for ourselves the future we want for our children. Without decolonization, Chamoru children have no future because at the rate the U.S. is militarizing our island, they won’t have a sustainable homeland to inherit. United Nations Resolution 1514 declares that peoples in colonized territories have the right to self-determination and the right to freely determine a political status. The U.S is using their Constitution to deny the Chamoru people our human right to self-determination. While we were in New York, we also held meetings with U.N. member states to talk about Guam’s situation and how we can strategize. We met with the ambassador of Bolivia and he told us that to achieve sovereignty we have to “be like ants.” In other words, I think it’s necessary for people in the movement to utilize all the resources that we can to uproot colonialism—politically, legally, spiritually, academically, etc. because we need to be everywhere. 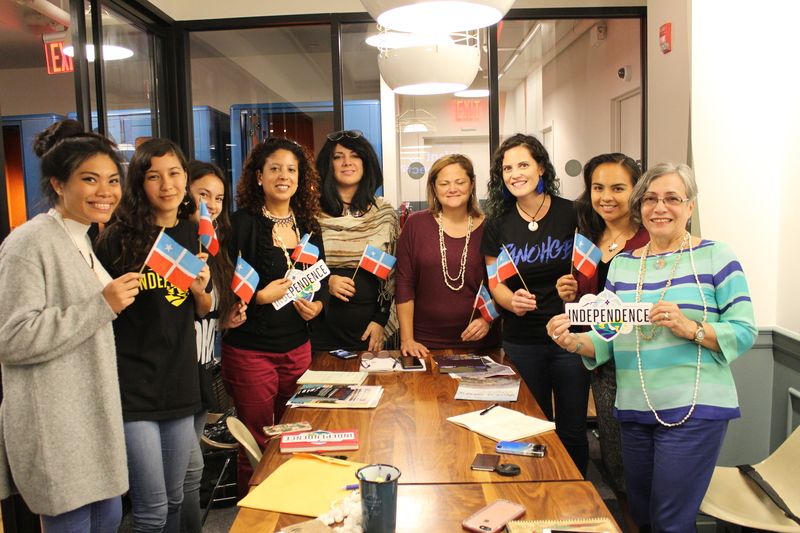 On our last day in New York, we met with a group of women who are part of Puerto Rico’s independence movement. We shared stories about our islands, and one of the women told me that she’s 70 years old and she’s been doing this work since she was my age. That hit me in a way that nothing else really has. I’m always talking about how much Chamorus have sacrificed, about the people that we’ve lost, but sitting at a table somewhere in Harlem across from a woman who looks at me and sees herself, sees everything that is yet to come—hits me somewhere deep and I walk a little heavier. You can’t get tired, she tells me. You can’t get tired because that’s what they’re waiting for.